I’m writing this a day after ringing the treble to Plain Hunt on 5 for the first time at Service ringing. I’m in no way an expert at ringing and probably never will be. But in my 30 months of ringing I’ve experienced and been tutored by brilliant teaching by a local Ringing Master called Dave* and have witnessed appalling and dangerous teaching along the way too. I’m at a point in my ringing where I feel that I would like to be more involved in passing on my hard-won lessons in learning basic handling but never felt confident about supporting new learners. In essence, I want to be more Dave. I know I can’t be more Dave on my own though and this is where the ART Teaching Bell Handling module gives me the structure and order that I need as a person and as a tutor. The day course took us ten ringers through a mixed programme of well-paced and relevant presentations in the church hall and sessions on the silenced bells in the easily accessed ringing chamber of St. John’s, New Alresford, Hampshire. The handling sessions followed a demonstration and copy in pairs format . With two ringers per rope , the component parts of bell handling, including raising and lowering , were broken down into separate teaching points and practiced , face to face , eye-ball to eye-ball, adult to adult with feedback and improvement increasing throughout the day. However many times you hear phrases such as ‘hold the tail end like this..’, or ‘long pull now…’, ‘catch higher up the sally..’ , there is nothing like hearing the sound of your own voice saying it to someone else. The view from the teacher’s side of the rope is very, very different. Teaching the basics to the capable is, once you get over the initial awkwardness, hugely rewarding. Sharing control of a bell feels strange to begin with but part of the purpose of the course is to familiarise ourselves with all the oddness of being the ‘other side of the rope’. A very safe way to experience these emotions and work through them so that, when facing a complete beginner, it is not a complete surprise. The one-to-one work in the Tower I was expecting. What completely took my breath away was the supporting ART materials. The course demonstrated and allowed me to experience a logical teaching progression in practice, but behind this are the materials for the tutor and also, importantly, for the learner. With two sides to every beginner’s rope we cannot forget what the learner’s journey is like. With my course pack I received some really nicely produced books emphasising the detail and structure of teaching and learning in the ART scheme. It is, after all, a scheme. An order of work. An interpretation of how the basics can be taught in a loosely formal way so that progress can be logged by both tutor and learner, the fundamentals not overlooked and achievement recorded and celebrated. Dave doesn’t need ART to teach. I know that I do. ART lets me be more Dave. I’m ok with that. What I lack in instinctive teaching ability I gain in structure and with it, confidence. And projecting confidence is essential in communicating new knowledge and developing a sustained and rewarding tutor/student relationship. Since participating in the M1 Course Teaching Basic Handling I’ve been more confident as a ringer in my own right, and more willing to step in and speak up with advice and support. We’re all different. Delivering teaching through the ART scheme may not suit every tutor or every learner. But thanks to ART I have the option of being more Dave. *Dave isn’t his real name…. ART Conference 2019 – Goes to Worcester! Mark Regan, the Ringing Master at Worcester Cathedral, who will not only be looking to the future, but offering visits to the Cathedral Ringing Centre. Book early, as places are limited! Matt Bulbeck, a professional outdoor sports coach and bell ringing teacher. New-ish ringers Ian and Louise Wilson, with their take on bell ringing leadership based on 20 years of knowledge and experience gained in industrial and academic settings. Simon Linford and Clare McArdle, who will be talking about Project Pickled Egg alongside the re-launch of the Learning the Ropes Plus scheme. Reflecting the rapid proliferation of questions and concerns around recent events, additions to the ART line-up include presentations from the Church of England about safeguarding and the C of E, bell ringing insurance and risk assessments. There will be opportunities to talk through any local issues with the experts who will be available throughout the day. The second day of the conference weekend concentrates on building a vision for the future of youth ringing and is hosted by the Central Council. A day of speakers and break-out sessions. A day for you to help shape the future. A day for anyone interested in developing the leaders and ringers of the future. The day will include a number of break-out sessions led by youth leaders. These will provide plenty of opportunities to share ideas and good practice and give you the chance to draw a vision of the future and start working towards it. The ART Conference is our leading national event and is open to anyone with an interest in ringing teaching and leadership. We would like to invite you to join us at Worcester on 2nd & 3rd March 2019 for what is sure to be a full and interesting weekend. Association of Ringing Teachers/ART Training Scheme: Course places available. Two great minds (Alan Bentley and Tim Kettle) have been at work together to host this great opportunity within the C&S District: A one day course (Module 1) Teaching Bell Handling. This will be held at St. Peter’s, Bournemouth on 9th March 2019 with tutor Gill Hughes. In time we plan to host more in the undercroft conference centre. St. Peter’s has great facilities within its undercrofts, and in time we hope will become known on the ringers-map as a ‘Learning/Ringing Centre’, as the church invests in making the staircase, tower, steeple, bells more accessible to the public and awareness. We are very lucky to home a beautiful heavy ring of 8 by Taylor’s (21cwt in E), recast as a complete set in the 1930’s. The tower is also home to the popular and successful weekly tailored practice night specifically geared towards bell handling. For more information please contact Tim Kettle, Ringing Master of St. Peter’s. 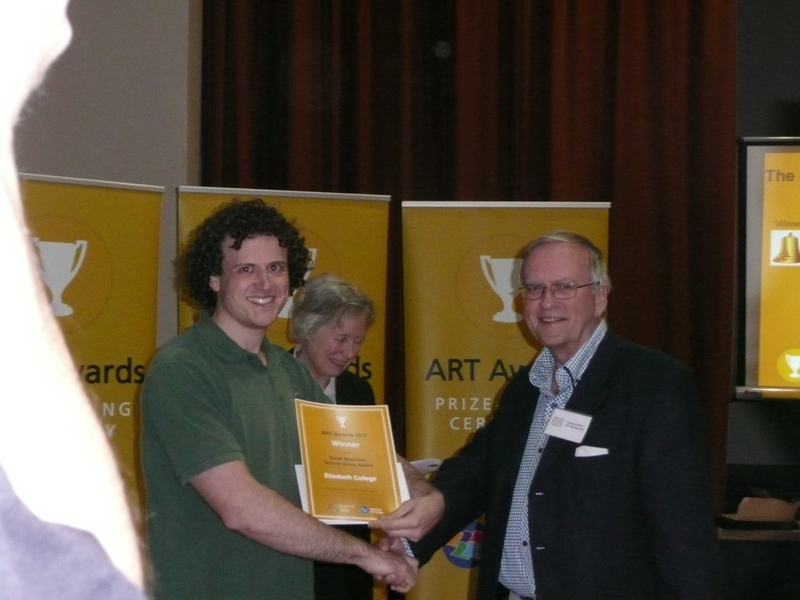 The ART AWARDS and how to apply. The judges (led by Stephanie Pattenden) aren’t looking for the most professional application; what they are looking for is ideas, commitment and results. So if you’re looking at new ways of recruiting it’s not just the idea, but the number of people you recruited and whether they stayed. Easy ways to show that – number retained a year or two later, new recruits coming in (success breeds success), quarter peals, striking competition results, practice attendance, or ringing progress (LtR Levels) and don’t forget photos and quotes. There’s no magic formula; think why what you’re doing has been successful and put it down on paper. Please don’t be modest! Having a vision or passion and making it happen: however big or small, making things happen is what leadership is all about, even if you don’t call it that. Getting young people ringing: over-turning all those misconceptions that exist about children seeing ringing as “uncool” and giving up at the first hurdle. 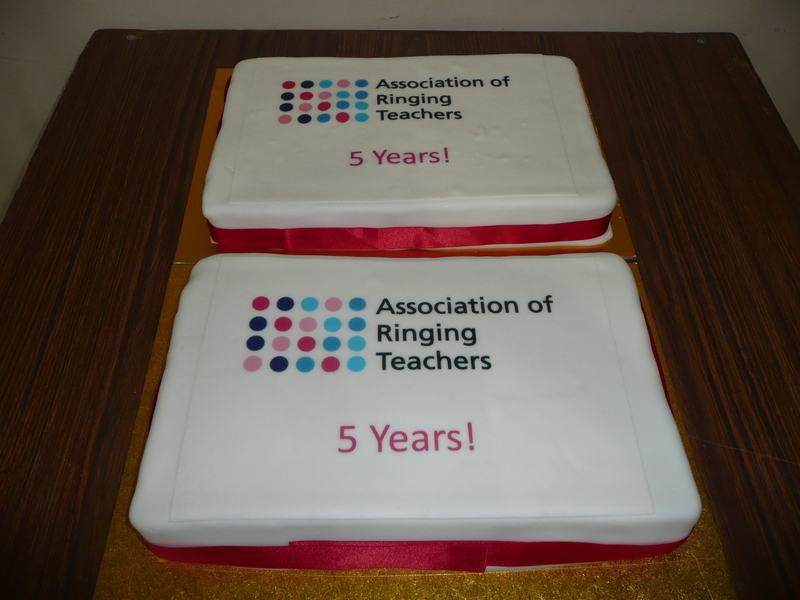 Further information and application forms are available at www.ringingteachers.org/recognition/awards. The closing date for applications is 31 December 2018 – so now is the time to make sure that those doing great work don’t miss out! The Ringing Remembers campaign has resulted in many people coming forward to learn to ring, but with the current profile of the ringing population, we need to continuously recruit and train more new ringers. Many people end up teaching because there is no-one else in their tower prepared to do it, and they have little or no training or support. Founded seven years ago to address this issue, the Association of Ringing Teachers (ART) has grown rapidly. More than 2,600 people have now attended one of the ART Teacher Training Scheme modules. Working with the Guild Education Committee, there will be an ART Module 1 day course (teaching bell handling) at St John, New Alresford on Saturday 26th January 2019 – 9.30 till 5.00pm. Further details are on the attached flyer for your tower notice board. Welcome to the latest issue of Tower Talk, the magazine for ringers on the Learning the Ropes scheme. This is a special edition for the run up to the 100th anniversary of the Armistice. 11 November is always a poignant day for ringers, but this year it is particularly special because it is the 100th anniversary of the Armistice and, on top of that, ringers all around the country are being recruited in the ‘Ringing Remembers’ campaign to honour the 1400 ringers known to have been lost in the Great War. We have taken this opportunity to introduce you to some of our newest ringers who have got involved through Ringing Remembers. There is plenty to read in here, but it’s only a flavour of all the hard work which is going on everywhere to get ready to ‘ring for peace’. TowerTalk Magazine – Issue 7 is out. Welcome to the 7th issue of Tower Talk, the magazine for ringers on the Learning the Ropes scheme. We hope that you enjoy this latest edition of Tower Talk. If so, why don’t you forward this email or print off a copy of the magazine so that other new ringers can feel part of this amazing community which stretches right around the world. The theme this time is ‘Ringing Around the World’. Have you ever been on holiday and heard bells ringing and felt the urge to join in? I think most of us feel that way, whether we have been ringing for years or just a few months! Those of us lucky enough to live in the UK can do this easily, but to do it in other countries takes a bit of planning. In this edition we hear from a few ringers who have combined travel and ringing. Course fee: £20, plus £6.50 for lunch & refreshments. how to form a strong band. This theory is supported by practical sessions that show how to develop these skills, including how to teach call changes, an exploration of kaleidoscope ringing, and different ways to introduce ringers to covering and plain hunt. A Teacher is a ringer who may have some or no teaching experience. New teachers will learn how to teach in a structured, effective way and develop their confidence while existing teachers will learn new skills and techniques. Anyone aged 14 years or older can participate. Experienced teachers are also invited to apply who would like to mentor a less experienced teacher. It is appropriate for the Teachers who are students on the course to have sufficiently good bell control to be able to inspire confidence in the new ringers, their mentors, the tower captain (if appropriate) and other members of the learner’s band. Welcome to the latest issue of ART WORKS, the magazine for ART Members and teachers on the ART Training Scheme. The magazine is an opportunity for teachers to tell others about their experiences, share their successes and keep them informed of news, tips and opportunities. Welcome to the 6th issue of Tower Talk, the magazine for ringers on the Learning the Ropes scheme. Happy New Year! to all ringers using Learning the Ropes – here’s to a successful year, and we hope you all achieve everything you have in your sights! With New Year comes talk of resolutions and in ringing it’s the same – and so this time we are focusing on the ’50 Ringing Things’ which provides a huge number of ringing related challenges which you can aim for and have a bit of fun as well. Have you seen the booklet? If not, you can find details of it here on the Learning the Ropes website, and you can order your copy from the ART Shop. With 50 Ringing Things, you can explore the wide world of ringing and the many different activities that hook fellow bell ringers into this addictive hobby. A variety of contributors have written a series of entertaining and informative tips and guidelines to help you get the most out of each challenge. When you’ve ticked off a challenge yourself, why not share your experience on the 50 Things Facebook group? And 15, 30 and 50 challenges completed entitle you to order a Bronze, Silver or Gold certificate! So let’s meet some of our fellow ringers who have thrown themselves into the challenge! Here is a magazine for your perusal over a cuppa. It gives a nice insight/update to what is happening. If you’re interested in helping ART on a part-time basis then we are looking to employ someone to keep up to date and improve our resources and web pages. More details are available on the ART website. Applications deadline is 31 December 2017. The deadline for applying for an ART Award is fast approaching. 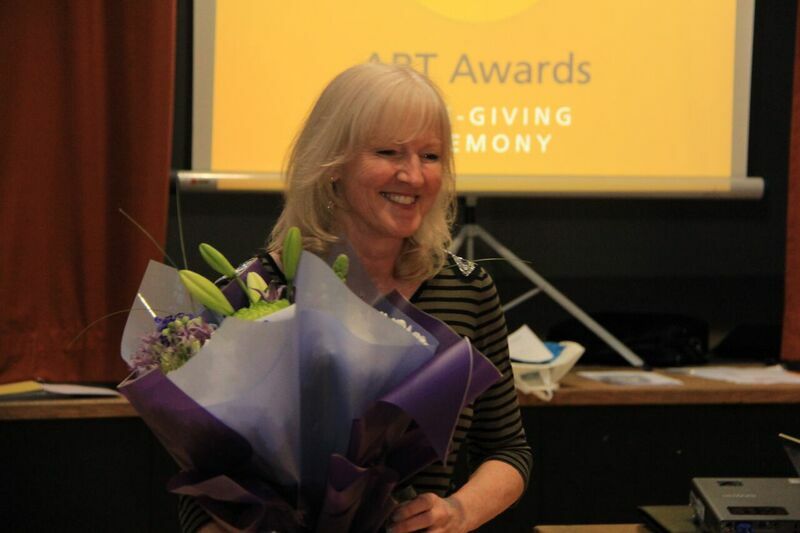 If you or a teacher you know is doing great things then why not apply for an ART Award. And don’t forget to nominate your Level 5 Learning the Ropes Achievers for an award – the prize structure has changed this year so more ringers are recognised and receive a prize. Have a look on the ART website for more information about the different awards and to download an application form. ART is very grateful to the donations of our growing number of ART Supporters in facilitating our work to deliver ringing teaching and learning fit for the 21st Century. Are you interested in becoming an ART Supporter? Please contact Graham Nabb. I know many of you will have seen the following message from Graham, think of it as a reminder if necessary to further encourage people you know who could qualify to apply, and to share the link with others in your catchment. Closing date for this year’s applications is 31 December. On behalf of ART Mgmt. Comm. The ART Awards continue to grow every year – with close to £3,000 awarded in prizes last year. Now is your chance to apply for the ART Awards 2018! The teaching awards are open to everyone – not just ART Members or those using ‘Learning the Ropes’ scheme – and the aim is to encourage and recognise the people and groups leading best practice and innovation in the teaching and development of ringing. Whilst it can sound intimidating to apply for a national award, when all you’re doing is having fun and making things happen, the ART Awards are there for normal ringers like you doing what you consider to be the right things – it’s only the rest of us that are in awe of what you are doing. Learning Tips No.5: Odd One IN! and encourage as many as possible to apply. It’s worth noting that some awards are also open to non-ART Members. There are just a few places left on an ART M1 course Saturday 14th October – well worth the journey to Lewes BN7 1JH if you haven’t done one yet! As ringers and teachers you are already making a big difference, but have you considered doing something more? Now could be just the right time. The ringer’s representative body, the Central Council, has voted for radical change and is now looking for volunteers who can make that change happen. It is setting up a small number of workgroups that require skilled, charismatic and hands-on leaders and helpers who want to make a difference. This isn’t a realignment of committees but is a much bolder project, aimed at doing what is required to build and secure a bright future for ringing. Something we in ART are all committed to. Anyone can volunteer to join or lead these workgroups. You don’t have to be a Central Council rep or a ringing society officer. What you do need, is a love of ringing, a desire to create a ringing environment fit for the 21st century and the skills to help deliver that. It would be great if a lot of ordinary ringers and teachers like you joined and made this happen. If you’re interested in volunteering then visit the “reform” page on the CCCBR website and complete the online form at www.cccbr.org.uk/about/reform/nomination-form. This form will be open until Friday 6th October. Do please think carefully about what you can do for ringing, and volunteer for one (or more) of these roles. This is a fantastic opportunity to make a difference; to give something back to ringing; and to build and secure a bright future for ringing. For more information click through to the Central Council website. The ART Training Scheme offers training, support and motivation to ringing teachers. New teachers will gain the confidence, techniques and support required to emulate the best, whilst experienced teachers will benefit from the resources and ideas which meet people’s expectations of a hobby in the 21st century. The approach focuses on breaking down the process of bell ringing into its component parts, giving techniques and background for how to teach each part before adding the sections together to create the whole. The scheme is based on best practice from ringing, other hobbies & education and supplemented with university research findings into how best to coach practical skills. New safeguarding training scheme has been made available for ART Members, and also this can be used by non-members of ART who wish to do the (free) online course. At the ART Conference in March ART announced the development of training workshops in number of subjects. There are many good training sessions that take place throughout the country, but so often the trainer has to develop their own materials causing a huge duplication of effort. ART is keen to have a repository of good materials and have ‘off the shelf workshops’ available for use to encourage more workshop training in new areas using the best materials and teaching. This may help avoid so many people reinventing the wheel. Many of these will have to be capable of variation to allow for audiences of different experience levels. Each workshop uses a combination of presentations and practical work. Currently handouts are handled by email but deletes on the workshops will get access to SmART Ringer in due course to view all handouts and other relevant information. All workshops will be advertised via the ART web site and already a number of successful pilot workshops have taken place. • Conducting – this focusses on Bob Minor but includes coursing order, transposition etc. • Bell Maintenance – A full day’s workshop to understand what basic maintenance a bell installation needs. • Simulator Awareness – designed for people with limited or no knowledge of simulators it explains the various sensor systems and software available . • Listen & Strike – helps develop listening skills and rhythm, leading to a reduced reliance on looking and better striking. • Tower Leadership – covers stakeholder management, leading the team, good practice and performance. Theory sessions augmented with lots of discussion. (Produced in conjunction with CCCBR). Other workshops are being developed and we would welcome good additional materials for existing workshops and ideas and assistance with new ones. These workshops will be run on a regional/local basis and we need to hear not just from people who would like to arrange a course but those who are prepared to run them. Workshop leaders clearly need to have knowledge of their subject as well as good communication skills and the ability to present well using Power Point. (Mileage expenses are paid to appointed workshop leaders). So if you need workshop training or could run one – get in touch! Aaron secured his Level 1 in Nov 2015 & now 18 months later he has his Level 5 – the highest Level in the ART scheme & we believe the first Channel Island ringer to achieve this Level. Aaron secured his Level 5 with an excellent quarter peal inside for Grandsire Doubles , but has already rung inside for quarter peals of St Clement’s , the treble to Cambridge minor and treble to bob major. Now with 18 quarter peals under his belt we are planning Aaron’s first peal over the summer. How do I arrange an ART Training Scheme course for new or existing teachers? It just takes someone with enthusiasm and the organisational skills to arrange the day and book people to come along. Keeping in touch with delegates afterwards, checking progress and arranging practice sessions is important but this task can be taken on by someone else from the group. Just get in touch with ART via the web site www.ringingteachers.org. Q – Where can you hold an ART Training Scheme Module 1 (Teaching Bell Handling) course? A – Anywhere geographically, but you need to find a venue with the right facilities. Q – Who can attend an ART Training Scheme course? Module 1 is intended for those who to teach bell handling and want to update their skills or those who wish to learn how to teach bell handling. More experienced teachers who may be mentoring new or less experienced teachers should also attend. The only minimum requirement is that each delegate should have reasonable rope handling – sufficiently good to be safe and to give a new ringer confidence. Module 2F supports both new and experienced teachers who wish to teach foundation skills – being the basic skills of good bell control and listening that are essential for progressing new ringers from rounds to Plain Hunt. Delegates should themselves have good bell control and listening skills. Module 2C is for teachers looking to develop or expand their skills in teaching elementary change ringing, from Plain Hunt and beyond. To attend Module 2C, delegates are required to demonstrate their change ringing ability through a quarter peal of Bob Minor inside. Q – What is expected of me if I attend an ART Training Scheme Module? Like any other course participation on the day is crucial! In addition following through by teaching soon after the course and recording your lessons and exercises in your Teacher’s Logbook is necessary. Much of the learning process takes place after the initial day course and the practical skills and theoretical knowledge has to be practiced to be fully understood. So, as with any other course, what happens afterwards is even more critical for the learning process. For Module 1, this means teaching someone to handle a bell from scratch and for Module 2F and Module 2C the experience is developed by running your own practices or training sessions. ART also encourages completion of each Module and accreditation within 2 years. Q – How many can be accommodated on a Course? Ideally ART like at least 10 as this will usually cover the tutors travelling expenses. However courses have been run with 20 (not ideal) and as few as 6 where the tutor has not had to travel far and incur expense. It is up to the tutor who many to take but remember that in the practical sessions in module 1 there need to be 2 or 3 people around a rope so the number of bells and space available is an important consideration. It was a pleasure to meet Peter and Christine Church from Hull at the A.R.T Conference handbells day recently. Part of the weekend was to chat to others from across our ringing world. I invited Peter to tell me a little of his own handbell story…I’d love to share it with you here. There has never been a strong handbells culture in East Yorkshire, the peak of achievement was back in the early 1970s when a dozen or so peals were rung, the last one being in 1979. Since then there has been a trickle of handbell quarter peals, and that’s it. I put my bells away in the early 1980s when children came along, and then promotions at work, and then Fair Trade, and then outsourcing. It wasn’t a bad life, no complaints, but no ringing. And then in 2015 during the Central Council meeting in Hull, an old friend came to stay, and during the time we visited Roddy Horton who had kept the handbells light still shining a little. The light re-ignited my interest in handbell ringing which had been dormant for 30 years. Handbell ringing is something that I can do, it suits my logical brain, double handed ringing has hard bits, lots of hard bits, and music. So in March 2016, I talked a friend and my wife into starting a weekly handbells session. We all have white hair and creaking joints, plus serious responsibilities to others. Two rusties and a handbell virgin is not a good way to start a major project, but progress was made, slowly, and Plain Bob Minor became ringable by the end of June. It was at that point I realised that significant progress would only be possible if we involved more ringers. In spite of advice to the contrary I organised a regional handbells workshop for late October 2016. Along the way we discovered a local ringer who had a copy of Handbell Manager on a laptop, with a couple of motion detectors. Instantly I could see the benefits of the system. Able to practise any time, any day, with “ringers” who never make mistakes. Any method, any speed, any number of bells. I was hooked. The October workshop was very successful. 15 ringers had a great day refreshing Plain Hunting and Plain Bob skills, and everyone achieved at least one step forward. Some had a go on the simulator. Part of the success was the discovery of 4 local towerbell ringers with some handbells experience. But then the real work started. The ringers were spread out across the county, there was no way they would all come together on a monthly basis, let alone weekly. However, by then the two “rusties” had been polished a little, and the handbells virgin had had some experiences. So we started travelling out and ringing with people at every opportunity. A second handbells day was arranged for end January 2017, and the progress in 12 weeks, in spite of Christmas intervening was tangible. Plain Bob Major was being rung by most people, some were turning out courses of and Kent and Oxford TB and Cambridge Surprise Minor. 4 people decided to shoot for a quarter of Plain Bob Major. 2 good quarters were scored in the February. And so we arrive in March 2017, the first birthday of the project. Some people fell by the wayside, some never got their legs going, but 4 people have rung 2 good quarters, and there are 7 more who are progressing in spite of only being able to ring once each month. Ringing is taking place in 4 locations, and it would be good to build a handbells band in each of them. Towards that possibility we plan to consolidate our progress with a number of quarter peals, and then to move on by running another workshop: “Going beyond Plain Bob” in July 2017. We have learned a good deal about the learning process, and whilst it’s OK for the teacher to be impatient, it is also very important to get the basics right. Standing up might not look like much of an achievement, but falling over because you’re trying to go too fast too soon is totally useless. We have learned a lot about the skills involved in handbell ringing. We have also learned a lot about how the brain works and the importance of driving stuff down into long term memory. Above all we have learned that there is still much real enjoyment to be had in creating the mathematical music of the bells. 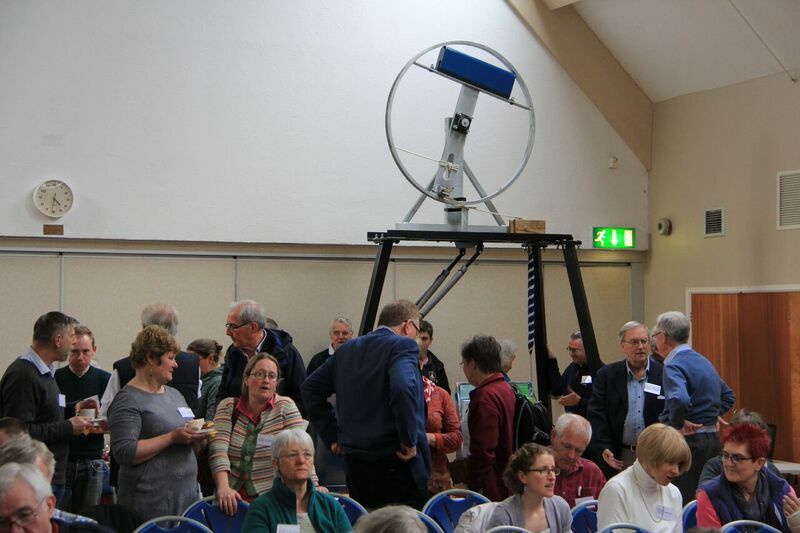 Around 115 tower bell ringers from across the U.K. descended on our Guild at Old Basing recently to enjoy two days of The Association of Ringing Teachers Annual Conference weekend. It was SO much more than a business meeting! This registered charity’s mission is simple..
“To improve the learning experience of new ringers”. ART, as it is known, offers training, support and motivation to teachers alongside a structured learning programme for new ringers. The association was celebrating its fifth birthday and there was plenty of reasons to be cheerful including the news that A.R.T. 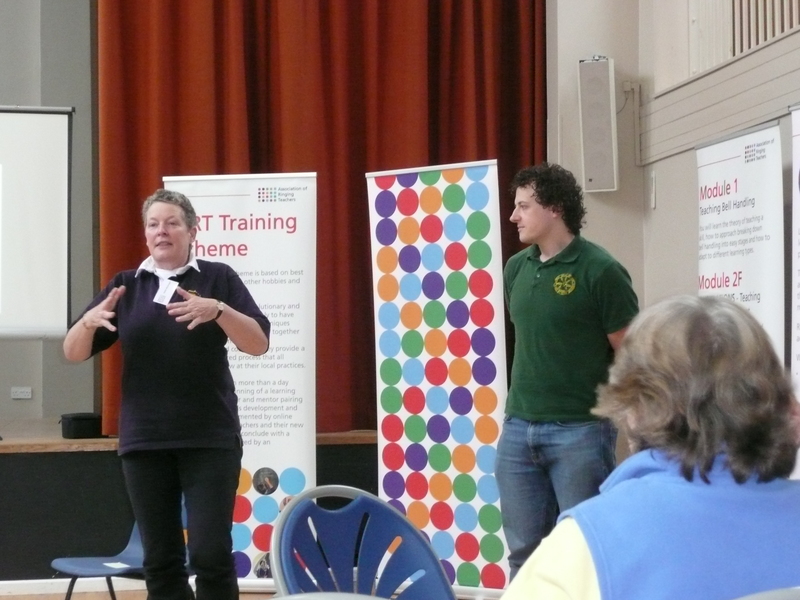 tutors coached more than 600 new ringers, getting them well underway with their ringing training in 2016.
being challenged by another guest speaker, Elva Ainsworth, asking us to reflect on our traditional bell ringing culture and whether or not we need to work on changing it to help sustain a healthy future for ringing. One of the highlights of the programme was The Sarah Beacham Awards ceremony consisting of nine categories.. Our “W. and P. members were delighted to see two Guild entries – St. Michael’s, Swanmore, Ryde received specific recognition from the Judges for teaching very young new ringers and Elizabeth College, Guernsey won the School Group Award – Duncan Loweth, coach, received the award on behalf of his team. It was very pleasing to note the great amount of interest in the method handbell training on Sunday, very ably presented by our own Duncan Loweth and Helen McGregor from the Channel Islands. We were reminded of the benefit to our tower ringing if we ring handbells as well. Rumour has it that several ladies from the Andover District enjoyed the handbell training so much that they are seeking to set up a new group in their area. Yay!! At the start of the event, A.R.T. Chairman, Graham Nabb said he hoped that all who attended enjoyed themselves, exchanged ideas and had fun. He was not disappointed! So, well done and many thanks indeed, Deb Baker and her team! W&P’s Basingstoke District impress ART 2017 guests with their food making skills. Basingstoke District’s volunteers put on a fine spread at this year’s Association of Ringing Teachers Annual Conference. ‘Literally the best ringers tea I have EVER had’! Said a lady on Saturday afternoon when she came into the kitchen just to thank the crew. Home made cakes, flapjacks, cupcakes, Eton mess and chocolate Mars Bar sauce for the profiteroles complemented an ambitious and tasty lunch for both days and an afternoon tea on Saturday. Vice Master Pete Jordan co organised with Deb Baker who was set the task of feeding 115 people on Saturday and 70+ on Sunday in quite a short time slot said ‘this absolutely could not have happened without a crew of intelligent, lovely people who could see a task that needed doing and simply got on with it. It was great to have Christine KW’s experience to fall back on and I was not surprised when she decided to stay after her allotted time was up. I’d like to say a huge thankyou to our volunteers; Nici, Ella, Martin, Fiona, Pauline, Sue, Helen, Heather, Steve, Betty, Mike, Christine and to Pete for sorting out taxis all other practicalities and letting me bend his ear’. Lesley Belcher speaks at the ART conference on what new ringers want, and how we can work better as teachers. The real quotes from real recruits may make you think….. that perhaps your new ringers might be wanting more but too polite to say so…? And it you want to regenerate your Tower then Lesley describes a tower where this has been achieved. Elva has been ringing since she was 12, and now works as an independent business psychologist advising a huge variety of businesses on their culture and practice as MD of Talent Innovations. From what we wear to whether we have a hoover in the tower, she provokes us to reflect on our culture and whether we need to work on changing it in order to create a healthy future. And the winners of the Sarah Beacham School Group Award are…. Elizabeth College, Guernsey! 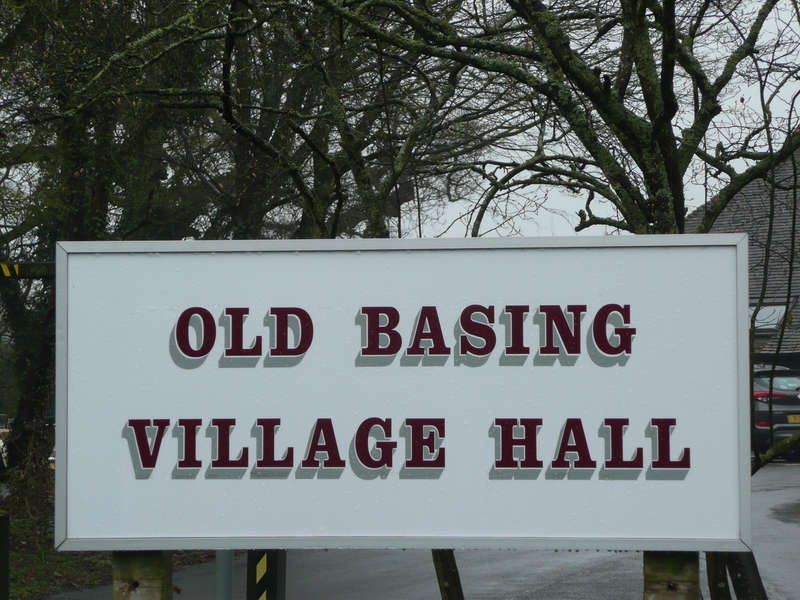 The ART (Association of Ringing Teachers) Annual conference is taking place in Old Basing over the weekend. 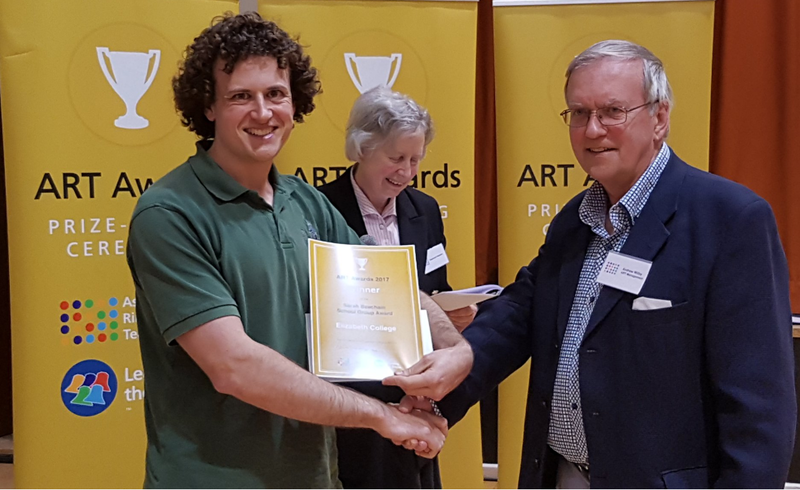 Saturday kicked off with the AGM (reporting a healthy surplus in 2016 and steady growth in many areas), followed by a series of seminars, The finale of the day was the ART award ceremony and the first award went to Duncan Loweth on behalf of his school band at Elizabeth College.